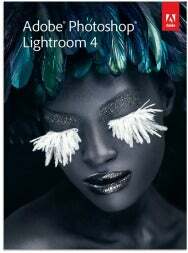 Adobe has released version 4 of Photoshop Lightroom, its professional photo management application, following a beta period of about two months. But perhaps the biggest news is that Adobe has permanently cut the price of Lightroom in half. Version 4 is priced at $149, as opposed to the $299 shipping price of version 3. The upgrade price is now $79, as opposed to the previous upgrade price of $99. "Lowering the price makes Lightroom more accessible to a broader range of photographers—from pros to amateurs,” said Tom Hogarty, Lightroom's principal product manager. The new Lightroom upgrade focuses on improving photographic results and providing a more complete workflow than previous versions. "Photographers have been asking for [workflow improvements] for quite awhile, and they've been having to use different tools to achieve those results. Now we're really at the point where we're saying that a complete workflow is now within Lightroom," Hogarty said. Lightroom 4's new features acknowledge, among other things, an increasing parity between photography and video, where both are swiftly becoming an integral part of overall photographic workflows. While photographers tend to specialize in one or the other, the marketplace is increasingly demanding that shooters now have a working knowledge—and a way to integrate—both stills and video as needed. Moreover, new capabilities increasingly built into cameras are bringing video into the mainstream for both personal and professional projects. Lightroom now lets you use the same controls for video assets as for images, and the program attempts to treat them as equal class citizens, Hogarty said. Lightroom 4's new Map Module uses built-in GPS metadata to let you search for images by location. 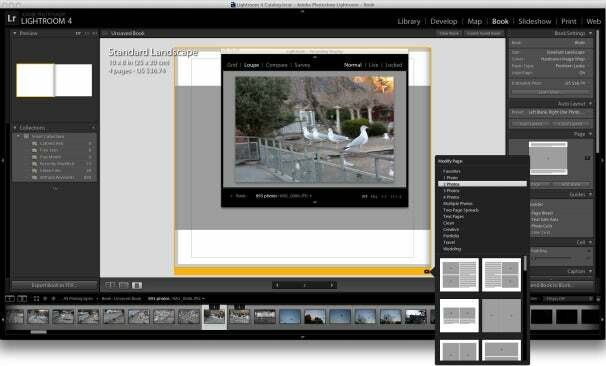 Lightroom 4's new features build on previous versions to improve image quality and expand output options. For example, new highlight and shadow recovery functions help to expose details that typically get lost in lighter and darker parts of an image. Additional adjustment brush options let you fine-tune your images to decrease noise and remove unwanted moire patterns. The white balance brush lets you adjust discrete parts of an image. New photo book creation capability is the result of a partnership with Blurb, with easy-to-use templates for clean, elegant photo-based books, complete with text. 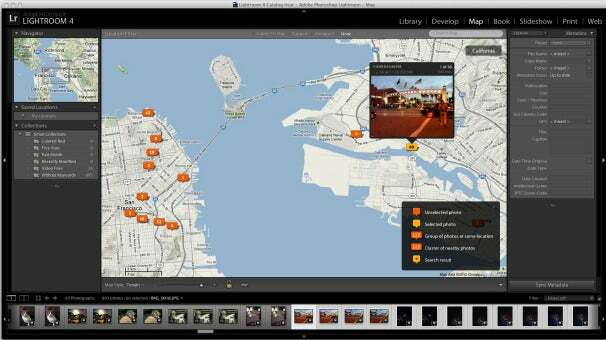 The new location-based photo organization feature uses your camera's GPS capability to let you search for and group images according to where they were shot, as well as display data from GPS supported cameras. A dedicated map module in Lightroom 4 is designed to help you pinpoint where you shot your images. It also works with the standard GPX track log file format to assist with tagging images by time and location. Adobe is also partnering with a number of lens manufacturers to augment Lightroom's lens correction features. The chromatic aberration part of the lens profile, the one that zaps purple fringing along high-contrast edges, has been inproved in Lightroom 4 to examine each individual photo for chromatic aberration and automatically remove it. Video support and video publishing let you first organize, view, and adjust video clips and then share them with social networking sites such as Facebook and Flickr. The program lets you view, trim, set a poster frame, and even capture a video frame as a still. A new soft proofing feature lets you preview how an image will look when printed on a color managed printer. Plus, now you can email directly from Lightroom using the email account of your choice. Lightroom 4 works on Macs with a 64-bit Intel processor running OS X 10.6.8 or later. It requires at least 2GB of RAM and a 1024-by-768 pixel display. It is available for sale on Adobe's website and through various third-party vendors, but the free beta version is also still available on Adobe Labs, and will be operable until March 31. Lightroom 4 is also destined to be part of Adobe’s overall Creative Cloud initiative, which is due on the scene by this summer. It will not be present in the cloud at launch, Adobe says, because engineering issues must be resolved before it can be made available via subscription. Adobe is encouraging users to contact them through various social media channels. The Lightroom team is available on Facebook and Twitter, and more information about the upgrade is available on the Adobe Lightroom blog. Lightroom how-to videos are also available on YouTube. Be on the lookout for Macworld's review of Adobe Photoshop Lightroom 4, which will be coming soon.